You are a great community! Locations of Surgeons participating in our Surgeon Survey. We are letting Surgeon opinion guide our platform design. In the context of a feasibility study carried out for a Horizon2020 grant we won in December 2014, we developed an online survey with few key questions pertinent to guiding our product development. The survey was distributed by us via an email invitation to surgeons we met at the conferences listed above, and by our clinical advisor, Dr. Marco Innocenti inviting select expert microsurgeons and key opinion leaders. These include the presidents of the World Society for Reconstructive Microsurgery, the Italian Society for Microsurgery, the French Society of Microsurgery, the Secretary General of the European Federation of Societies for Microsurgery and the founder of the European School of Microsurgery. Using these two channels we gathered 49 responses. 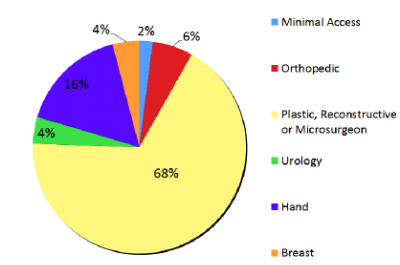 Cumulatively we have responses from a group representing over 4000 annual microsurgeries, while most surgeons participating perform fewer than 100 microsurgeries per year. One goal of our product is to lend dexterity to surgeons who perform small volumes, permitting them to maintain a high, uniform level of quality without practicing microsurgery on a daily basis. · Being mounted on long shafts, the depth of the anastomosis will no longer be a factor for the surgeon, who will work with the master, designed to be similar to classical instruments surgeons are used to operating with. · The surgeons movement will be scaled by the robot, permitting smaller interventions to be performed more easily. Hence a 0.5mm anastomosis, currently beyond the capabilities of most microsurgeons, will be performed with the same ease as a 1mm or above anastomosis. Furthermore, we found that the prevalent opinion among surgeons(65%) is that microsurgery has not yet found all its applications, but will grow in its implementation. We expect a robotic platform to permit surgeons who would otherwise not have the confidence or expertise to perform microsurgery to integrate microsurgery into their practice after training on the robot. Our prediction is that this would improve outcomes of many interventions in neurosurgery, transplant surgery, cardiovascular surgery and other as yet unexplored specialties. Finally, 75% of surgeons declare a strong interest in emerging technologies such as robotics and imaging, indicating a consensus that the future of surgery will be driven by technologies yet to be developed. Our collaboration with surgeons will result in a product tailored to their needs. There have been a number of academic attempts at bringing robotics to microsurgery, which have not resulted in a product. Here are some references to reviews and articles on robotics in microsurgery, including the technical and clinical results of research projects at the University of Tokyo and at Jet Propulsion Labs, as well as an overview of the application of commercially available robots not tailored to microsurgery. 1. Master-slave robotic platform and its feasibility study for micro-neurosurgery. Mitsuishi M. et al., 2013 Jun;9(2):180-9. doi: 10.1002/rcs.1434. Epub 2012 May 16. 2. Applicability of the robot arm for microsurgical operations. Krapohl BD et al., Handchir Mikrochir Plast Chir. 1999 Sep;31(5):333-8. 3. Computer-guided microsurgery: surgical evaluation of a telerobotic arm. Krapohl BD et al., Microsurgery. 2001;21(1):22-9. Ahmet Gudeloglu, et al., Semin Plast Surg. 2014 Feb; 28(1): 11–19. 5. Robotic Assisted Microsurgery (RAMS): Application in Plastic Surgery. Sanjay Saraf. Medical Robotics, Vanja Bozovic(Ed. ), 2008. ISBN: 978-3-902613-18-9, InTech, DOI: 10.5772/5261. 6. Telemicrosurgery: Robot Assisted Microsurgery. Livernaux PA, Berner SH, Bednar MS, Parekattil SJ, Ruggiero GM and Selber JC. Springer, 2013. ISBN: 2817803906.